Complete Lighting & AV - Silver Package - Spark Rentals Inc.
​With a complete lighting and AV package, we'll take care of everything from the venue lighting, to the speakers & microphone, to all the lighting and effects for the dance floor. Our audio visual equipment includes everything you'll need to ensure speeches and slideshow presentations will go off without a hitch. Plug a variety of sources into the speakers, including laptops and SmartPhones, which can also be wirelessly connected via Bluetooth. All equipment comes ready to go for seamless use. 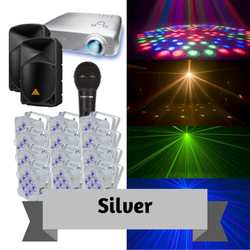 Our DJ lighting & audio equipment includes everything need to get your dance party started. For use in addition to, or replacing a DJ's services, wirelessly connect any Bluetooth device to play music from a SmartPhone or laptop. All of the DJ lights and lasers have built in microphones to automatically detect and move/change colours to the music.